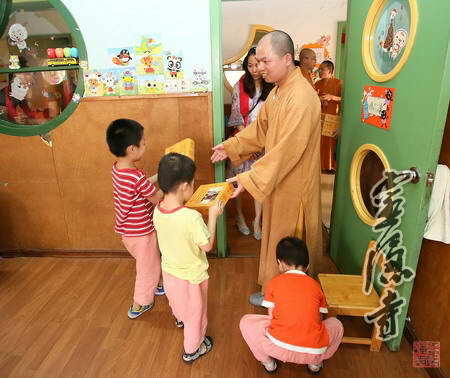 The Annual Mid-Autumn Moon Festival is upon us, from Sept 13th-Sept 15th, Lingyin Temple’s Venerable of the Charitable Foundation led the Yunlin (Lingyin) Volunteer Committee to local rehabilitation centers, homes for seniors, and Center for Disabled Children. 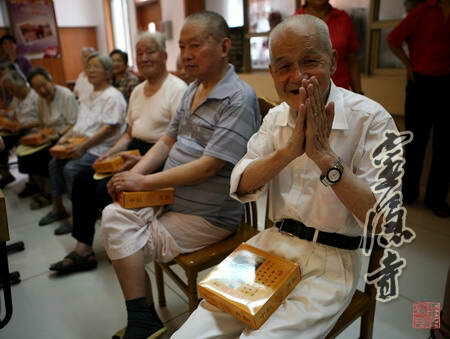 As part of Lingyin Temple’s ongoing interest in uplifting the welfare of the community, through compassionate spirit in caring for all in society, the group presented traditional moon cakes from Lingyin Temple and Jingci temple of Hangzhou for the elderly, disabled, and children—a gesture of kindness consistent with Buddhism. 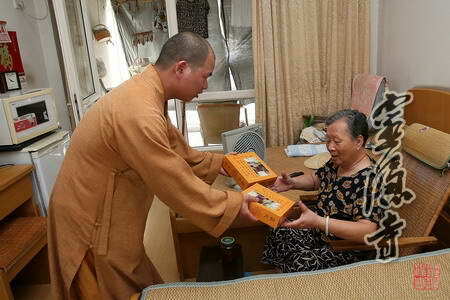 The Charitable theme of “Delivering moon cakes, delivering caring” for this year’s special benevolent committee--led by Lingyin Temple’s Venerables Hengyong, Hongzhi, Guoyuan, and Huicheng--manifested in an heartfelt effort along with the volunteer committee. 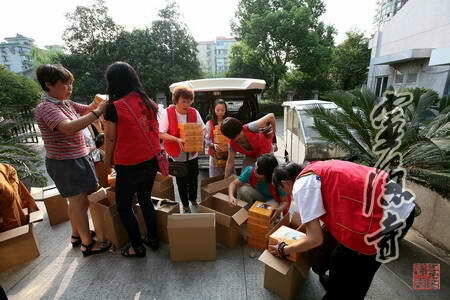 The care packages included 986 gift boxes of moon cakes from Lingyin Temple and Jingci Temple, 68 boxes of bananas, 43 boxes of apples, 61 boxes of dates, and approximately 100 pounds of various sweets and snacks. 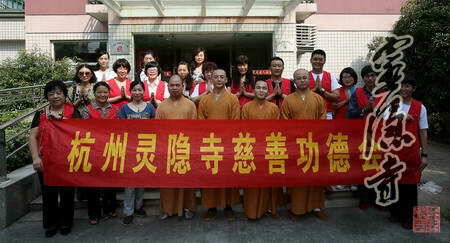 Locations included the Chaohui Street Clinic, Downtown Senior Home, Zhejiang Provincial Rehabilitation Center, Jingfang District Home for the Elderly, Stonebridge Northview Senior Home, Xixi Center for Disabled Children, and the Old Town Senior Care Center—an earnest holiday well-wish effort from Abbot Venerable Guangquan of Lingyin Temple and the Sangha for this traditional mid-Autumn festivity. Production for this year’s Lingyin Temple vegetarian moon cakes began on the 10th day of the 7th month of Chinese lunar calendar (August 16th). Every single moon cake was made at the onsite facility (Lingyin Temple’s dining hall). With 75 volunteers certified by the Department of Health and Safety, they crafted over 90,000 pounds of vegetarian moon cake. The Su-styled moon cakes are handmade without any artificial additives and the ingredients were carefully selected for five flavors: gingko, lotus seed paste, salt pepper, black sesame, and rose. In contrast to the common vegetable/salad oil on the market, Lingyin Temple used only Greek Argic first press olive oil to ensure quality flavor and for healthy dietary considerations. 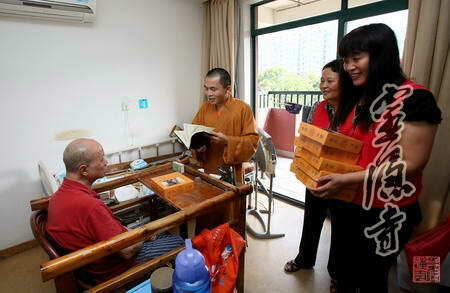 Upon receiving the Lingyin moon cakes, there was a strong sense of affection throughout. The elderly, children, and the disabled individuals savored the flavors of the traditional holiday treat as well as the well-wishes from the ancient Temple of Lignyin. They listened in on the Dharma stories, the Venerable Masters helped the elderly with their outfits and shoes, they discussed sutras and thoughts of the heart. A natural sense of caring seemed to build without notice along with the activities, as did a mutual sense of admiration from the two sides. To assist the less-fortunate, mind the welfare of community, appreciate the strength of society, and giving back have all been means and goals of the Lingyin charitable work. The mid-Autumn Moon festival is another opportunity in which temples can provide for the less-fortunate and those in need. Whether the treat is organic vegetarian moon cakes or annual Laba porridge during the Laba celebration, the compassionate spirit here is “from the masses, back to the people” and in turn happiness for all—to appreciate the grace from the security of the land, appreciate the grace of harmony for living beings.